As a professional interior designer in Bergen County, NJ, I am noticing that as more and more bathrooms are being renovated, clients are increasingly asking for a more contemporary look. #1. 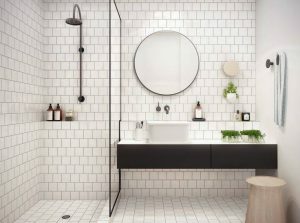 What is the best way to introduce a modern element to the bathroom? 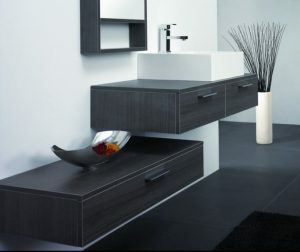 The vanity is often the focus element in the bathroom that tends to embody the styling and personality of the space. A wall hung vanity adds a certain amount of sleekness to the room, while it is still functional as a space for the accessories you need on the surface. #2. What is an advantage of using a wall hung vanity? If a wall hung vanity is selected, the entire floor is tiled and wall tile extends up and under the vanity. This enhances the space and makes it look larger. A great way to add drama is to add underneath lighting to the vanity. It also doubles as a night light! #3. Are there considerations to know when installing? For safety reasons, you should know that there correct methods of installation for a wall hung piece. There are braces that are made from heavy duty metal that go through the back of the vanity, through the sheet rock and into the studs for support. The L shape portion goes underneath the vanity to add more support. Additional long screws go inside the vanity into the studs to give it more support. Since the area of the sink is not elongated, a low trap should be specified underneath the sink. There are lots of styles and varieties to choose from. Let us know if we can help you with your bathroom redo!